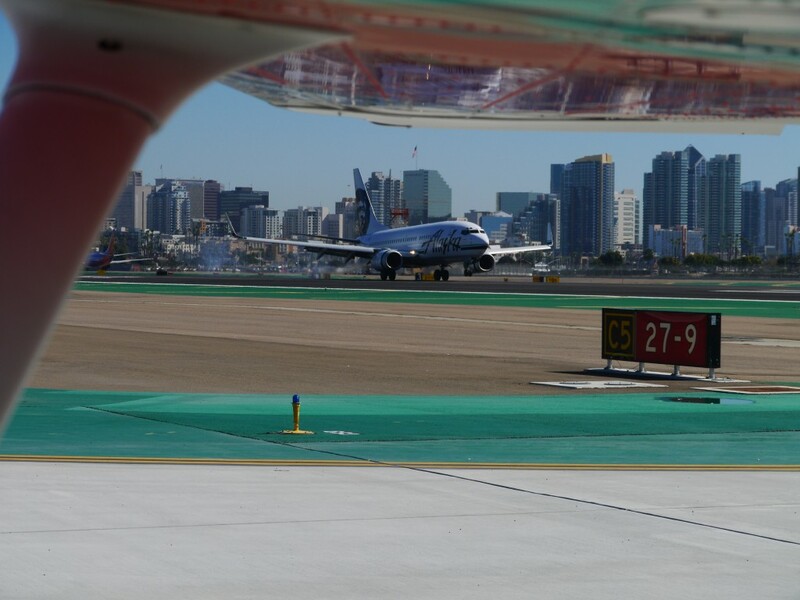 A common question is whether little airplanes flown by private pilots can land at large airports like LAX. The short answer is a qualified “yes”. The largest airports in the US are known as Class B or Bravo airports; examples include Los Angeles International (LAX), McCarren International (LAS), San Diego International (SAN), and San Francisco International (SFO). I’ve personally flown into two, LAS and SAN, and there’s a number of things you should do before attempting to fly into one of these airports. These large airports are classified as Bravo because they have a very high level of jet traffic. We should adapt as much as possible to the reality of being, at best, a tolerated guest. While there are many similarities between Bravo airports, there are significant differences too – some will be more small airplane friendly than others. For instance, 100LL isn’t even available at LAX (as of Feb 2013); that’s an indication that LAX is generally less piston friendly than some other Bravo airports. Costs. It’s possible you may have to pay some combination of landing, ramp, or overnight fees, possibly in addition to high fuel costs. Fuel that is $2/gallon higher than my home airport and $50/nt parking is not uncommon. There is no guarantee of being able to get in VFR to one of these airports. I’ve learned through experience at LAS that at many times, you may be told ‘unable’ and offered a nearby alternate airport. Expect it to take extra time getting in and getting out of these airports. Vectors for traffic sequencing, delays in clearance, and long waits for departure are all possible. So, with all those possible downsides, why would anyone go into a Bravo airport? First, there’s the ability to say you have. Second, it may be a more convenient airport. It’s hard to beat the convenience of LAS to parts of the Las Vegas strip, or the proximity of SAN to downtown San Diego. Research current information on FBO alternatives and costs. I find that AirNav has a variety of reviews with information about FBOs and especially how they treat general aviation. I recommend calling or emailing the FBOs to ensure that you know what costs you will incurr. Email has the advantage of having those costs in writing. Get a current TAC. Each Bravo airport has a Terminal Area Chart (TAC). Study it carefully for nearby VORs, reporting points and freeways. For example, at SAN we were asked to report Mission Bay (both a VOR and an area). At LAS, I’ve been asked to fly over the 15 and report over the Stratosphere. Trying to find those at the last minute is not a good idea. Review procedures for wake turbulence avoidance for both approach and departure. You will almost certainly begin given “caution wake turbulence…” warnings at some point. Review procedures for clearance delivery. Clearance delivery is a step before talking to ground control. You will receive climb out instructions, a transponder code, and the frequency of the approach control to contact when told to by tower. Find and review a current detailed airport diagram ahead of time. It’s easy to get lost on the ground when operating at an airport designed for much larger airplanes. Signage may be hundreds of feet away. Intersections can be very complex. Know where you are going. Take special note of Hot Spots (marked with HS#) as they are intersections known to cause problems. Note if the airport requests that you leave your transponder on when taxiing. Listen to tower and approach control. Most Bravo airports have feeds on LiveATC Listening to the feed for the airport at which you intend to land will give you an idea of how busy it is, how common small planes are, and possibly what are common or unique procedures at the airport. Get very comfortable with your radio communication. Quick and succinct responses are key. You have to contact approach control well ahead of entering the Bravo airspace. Getting flight following at the beginning of your flight helps ensure that. The closer you get to the airport, expect it to be busier on the radio. Listen carefully for clues to how you are going to fit into the flow. Are smaller planes being separated on to a different runway (for instance 19R at LAS). Are there common reporting points? Respond quickly and succinctly. If you know a transmission was for you, but you missed the content, a quick “say again” is better than saying nothing while you try to figure out what was said. When you are being readied for landing, expect to be told where to look for the plane you will be following, to be told how far out the plane that will be following you is and to be asked for maximum forward speed and a quick clearing of the runway. Most large airports have exits to the taxiways that are designed to be taken at higher speeds (more gentle turns). Remember that you should move as quickly as is safe to cross the hold bars, so as to be clear of the runways. Know ahead of time which direction you are expecting to turn. Once clear of the runway, contact ground. If unsure of taxi route, you may ask for progressive taxi instructions. As you near the FBO, expect to see personnel either in a vehicle, a golf cart or on foot who will direct you to parking. You should be familiar with aircraft marshalling signals (hand and/or batons). A quick shutdown of the engine is appreciated by ground personnel after you are in position. In most cases, the plane will not be tied down, but will be parked and chocked. You are generally asked to not put on the parking brake, as you will often find that your plane is moved during your stay. At some airports, you may be required to get a ride to the FBO (for safety or just as a result of distance). If walking, be alert for moving aircraft and prop/jet blast. Once inside the FBO, you will need to check in. You should give detailed instructions for any fueling, provide contact information, and in some cases you will need to provide a credit card for charges. One advantage of FBOs at larger airports is that they typically provide many more services. Most will have shuttle service to nearby attractions, accommodations, or restaurants. Some have rental cars available on site. You may need to be escorted to the plane, or at the least may need to be “buzzed through” a secure door to get to your plane. Preflight as normal and especially ensure that the airplane has been fueled as expected. Determine if you need to move the plane prior to start. My rule of thumb is to not start the plane where my prop wash will hit a plane 50 feet away or less. Once you have completed your starting checklist, listen to the ATIS and contact clearance delivery (some people recommend contacting them prior to engine start; if battery power allows this, it can save wasted fuel). As an example: “Lindbergh Clearance, Skyhawk 98326″… “Cessna 98326, go ahead”… “326 is at Landmark with ATIS alpha, VFR to El Monte”… “326, on departure, turn to heading 310, maintain at or below 2000, squawk 1234, departure frequency 123.4”. Readback the instructions and you’ll be ready to contact ground for taxi. In many cases there may not be an official runup area. Inquire with ground where best to do runup. If you are in line with jets, be careful to position your plane to avoid jet blast and position flight controls per recommendations for taxiing in winds. Don’t be surprised to be given a “line up and wait” instruction (and to read it back). This procedure is designed to help improve traffic efficiency on departure. Class Bravo airports can be quite intimidating to even experienced pilots, but with a little preparation and a cool head, it’s possible for even us little guys to safely mix it up with the big iron. Everything that I’ve said here will apply at Class C airports, though I have found the Class C airports are generally much more GA friendly. Nicely done, Dave. Having been based for a time at Detroit Metropolitan (DTW) and having flown several times into New York La Guardia (LGA) I would also add for pilots to beware of fuel when flying into Class B. Holds, re-routes and delays are the rule. When VFR, I always like to be carrying an hour more then my normal reserves when contacting approach. For IFR, I try to make sure that my fuel time remaining is as close as possible to what I said I had, and what ATC expects I have, when I filed. Have an nearby alternate handy, even in good weather, in case you need to get down in a hurry to avoid a fuel emergency. Thanks Joe! It looks like you can get 100LL at both LGA and DTW. How were both in terms of GA friendliness? DTW is definitely GA friendly, though the pricing has taken a sharp rise since Signature left. Most of the controllers there are aware of GA performance limitations, and they have a lot of room to separate slower traffic. They’re also quite accommodating to VFR arrivals. Delta has a hub there so try and avoid the “push” times in the early morning, late afternoon and early evening on weekdays. LGA, not so much. 100LL is horribly expensive ($8+) and the fees ran me $150 or so. The controllers are good, but they’re also dealing with a lot more traffic in a lot less space then most of us are used to, so good radio procedures are a must. They’ve been good for me with putting me behind smaller, regional planes on takeoff, but its always a good idea to pay attention to where the jet ahead of you leaves the runway! I’ve never tried a VFR arrival there and wouldn’t recommend it. Your point about high-speed approaches is a must here. If one is rusty or inexperienced at flying an approach at 120kt then I would strongly urge scheduling some dual with your favorite CFII before trying any of the NY Class B’s. Putzing along at 90 is not going to win you any fans with NY Approach. I just got a quote for ramp fee at an FBO at LAX… $100. In the case of LAX, they really don’t need to be small GA friendly. In almost any case I can think of, you’d be better served to go into HHR.